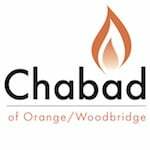 At Chabad of Orange / Woodbridge - the services are traditional and conducted in a joyous, casual atmosphere. Many of those who attend cannot read Hebrew, yet everyone feels at home. The prayer book is bi-lingual and various English readings are included in the service. Song and commentary add meaning and participation to the prayers. An important part of our community is the weekly Kiddush Luncheon that follows the Shabbat morning services, where friendships are created and nurtured and where we celebrate each other's happy occasions and anniversaries.